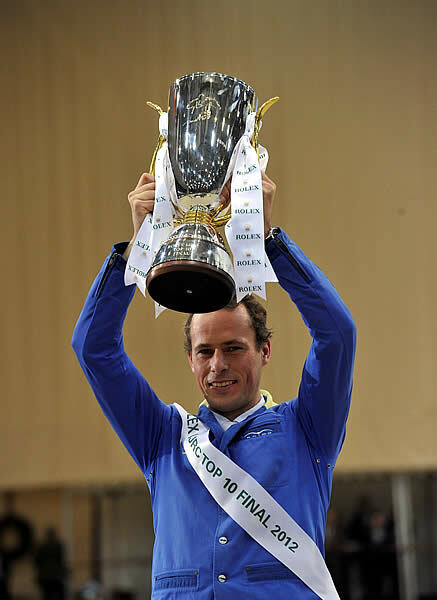 Lausanne (SUI), 10 December 2012 – Christian Ahlmann (GER), winner of the Rolex IJRC Top 10 Final in Geneva (SUI) last Friday, has taken over as World Number One in the Rolex Rankings, published today. With 2,555 points, Ahlmann has jumped up from third place into the top spot, demoting Olympic champion Steve Guerdat (SUI) to second place on 2,455 points. Ahlmann’s compatriot Marcus Ehning has also moved up the Rolex Rankings, going from seventh into third place, with Frenchman Kevin Staut now placed fourth. Christian Ahlmann took up riding at the age of 11, but it was in 2003 that he really caught the attention of the media when claiming team and individual gold at the European Championships in Donaueschingen (GER). The following year, he was part of Germany’s bronze medal team at the Athens Olympic Games and also took team bronze at the FEI World Equestrian Games in Aachen (GER) in 2006. In July of this year, Ahlmann and his partner Judy-Ann Melchior (BEL) celebrated the birth of their son, Leon. Next week, the new world number one will also be marking his 38th birthday. Ahlmann is currently lying sixth in the Rolex FEI World Cup Jumping 2012/2013 standings, halfway through the series, and will no doubt be setting his sights on repeating his Rolex FEI World Cup Jumping 2010/2011 win at the Final next year in Gothenburg (SWE).